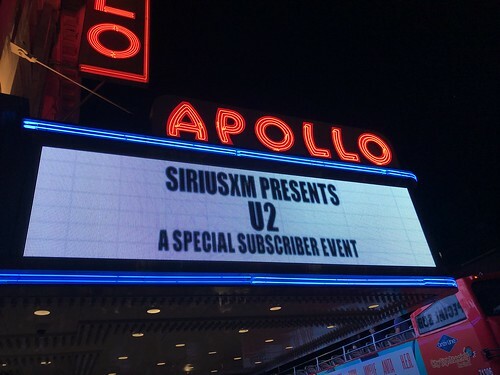 Comments: Although U2 filmed portions of the “Angel Of Harlem” video at the Apollo Theater and Bono made a brief solo appearance there six years ago, tonight marks U2’s first official show at the legendary New York City landmark. The seats on the floor are removed to accommodate a general admission floor area for the first time in the venue's history. Bono dedicates an emotional "Stuck In A Moment" to Anthony Bourdain and his family by saying "...who i'm sure had stories he couldn't tell us." Bono has a lyric hiccup during “Every Breaking Wave” and needs to restart the song. Other celebrity sightings at the show include Cindy Crawford, Little Steven, John McEnroe, Jon Bon Jovi, Robert Kraft and Andy Cohen.